The Norwegian Meteorological Institute was hammered by a flood of telephone calls after the light show had concluded, though astronomers say that the startling display was not connected to the Aurora Borealis. Though TromsÃ¸ Geophysical Observatory researcher Truls Lynne Hansen said he believed the light had been the result of a Russian missile that had spun out of control and exploded - with the mysterious spiral light a result of moonlight reflecting off the missile's fuel - the Russians initially denied any missile tests had been conducted in the area last night. Besides, one look at the pictures should tell you that an exploding rocket probably wouldn't look like that - nor would it last over ten minutes. From the pictures, it really does seem like some gigantic CG display, and one Norwegian witness added that he "initially thought it was a projector." The Escapist's own Jordan Deam, after viewing the videos on YouTube, observed that it was obviously a wormhole through which aliens had reached the earth (and watching the second video, the phenomenon's disappearance certainly does look like what you'd imagine a wormhole to look like). Others, like Escapist forumgoer Carnagath, joked that it might be a Dante's Inferno marketing stunt (for the sin of "Astronomy" or "Being Norwegian"), though Senior Editor Susan Arendt was quick to point out that it was clearly a Ubisoft logo, not an EA one. Reports of young Kryptonian babies being found in the Norwegian wilderness in the direction of the light remain uncorroborated. As for my personal take on the matter? Well, anyone who has seen uber-mecha anime Tengen Toppa Gurren Lagann knows that a blue-green spiral light can only mean one thing: Somewhere, ridiculously huge giant robots are fighting, and it is completely awesome. Update: Apparently, official word is that it was a failed Russian test of a Bulava missile fired from a submarine in the White Sea. But I don't know, this feels a little like "oh, it was swamp gas reflected off a weather balloon" to me. 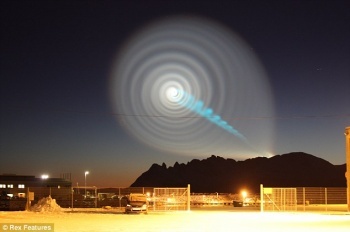 How exactly does a failed missile result in a perfectly spiral twelve-minute light show? I could certainly understand a missile producing a light show like, say this one from November 1st, but this looks nothing like a missile at all. Update 2: Okay, so a genuine rocket scientist whose name may or may not be Dr. Atlantis has some computer simulations that would show how this phenomenon would be created, and it's a bit easier to swallow now. But ... I mean, come on, the guy's name is Dr. Atlantis! He's either an alien or a supervillain, and either way you know he's gotta be in on it. I'm still going with the Spiral Power Giant Robots thing, though. I like it best.